Today’s tour includes Mutianyu Great Wall, spectacular and less crowded than other wall sections (including a round way cable car ride); the Temple of Heaven, and the Cloisonné factory where you could see the demonstration of Chinese cloisonné making process as well as learn the culture. Visit the Tiananmen Square, the largest city square in the world, and then walk to the nearby Forbidden City, a majestic palace of 24 Chinese emperors. Transfer to the Hutongs where records the face and history of the old Beijing and city life. You will have a fresh rickshaw trip, visit the Bell Tower and Drum Tower, as well as a local Hutong family and their special courtyard house. Morning tour starts in the beautiful Summer Palace, an imperial garden as the entertainment resort of emperors and their family (a lake cruise included). You also have the opportunity to learn about Chinese pearl culture in the Pearl factory. After lunch, be transferred to airport and fly to Xian. Upon arrival, be picked up by the Xian local guide and driven to the hotel. Begin our first day sightseeing in this ancient capital. Of course we will first see the impressive Terracotta Warriors and Horses, the ‘underground army’from the first Chinese dynasty. Then we will see the other historic landmarks, Xian City Wall and Big Wild Goose Pagoda. It is so exiting to buy some copies of the Terra-cotta Warriors in the Xian Art Pottery Factory. Morning visit in the Shaanxi Provincial Museum, focusing Shaanxi’s role in the development of Chinese civilization. Have a lunch and then be transferred to airport and fly to Dunhuang. Arrive in Dunhuang airport and be transferred by the local guide to hotel. Dunhuang is an obvious peal on the Silk Road. Visit the landmark, Mogao Grottoes, a world reputed Buddhist cave art treasure by its 2,400 lively Buddha statues and frescos. 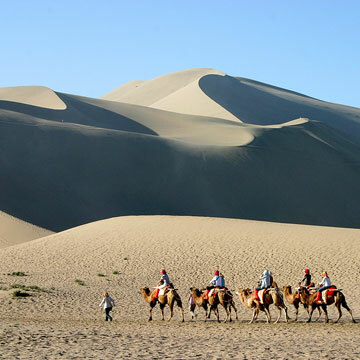 After the lunch, experience a short camel ride along the Echoing Sand Mountain to reach the crystal-like Crescent Lake. Besides the Mogao Grottoes, Dunhuang is charming for its mysterious desert and the earlier Great Wall. Today we are going to see the Great Wall of the Han Dynasty (206BC-220AD) and the Desert Discovery at Yadan Landform Park, which is called the Evil City for its night sound and vivid animal-like rocks. Finally, be driven to the railway and take an overnight soft sleeper to Turpan. Arrive in Turpan railway station in the early morning; be picked up by the local guide. In this exotic city in China, you will have a full experience with its local minority culture. Visit the Karez Well, Grape Valley, Jiaohe Ruin and the Turpan Carpet Factory. Drive to Urumqi after breakfast, to visit the Heavenly Lake, an extremely beautiful lake nestling in snow-capped Tianshan Mountain at 1,980 m above seal level. Have a lunch and fly to Kashagar with this beautiful memory. Be picked up at Kashgar airport and driven to hotel. Morning visit to the Lake Karakuli at 3,600 m high, a shining peal embedded among the peaks. After lunch, fly back to Urumqi. Overnight at hotel. Come to the south China city-Shanghai by plane; be picked up at the Shangahai airport and have a lunch. Start our Shanghai tour in Yuyuan Garden, a southern Chinese classical garden. Then we visit the Bund and the 52 buildings group of different countries, recording the colonial history of Shanghai. The Nanjing Road, east of the Bund is China’s premier pedestrian shopping street. Continue our sightseeing in this modern metropolis. Shanghai Museum houses 120,000 precious historical artifacts, which is a highly acclaimed museum in the world. In the Jade Buddha Temple, feel the local belief. The Oriental Pearl TV Tower has been the symbol of Shanghai and features a ball-shape observatory that gives very impressive panoramic views of the city. Free time before departure. Send you off at the airport, end of our service. Wish you a pleasant journey home! *China internal flights: Beijing-Xian, Xian-Dunhuang, Urumqi-Kashgar, Kashgar-Urumqi, Urumqi-Shanghai. *Soft sleeper train tickets: Dunhuang-Turpan.